Margaret K. McElderry Books, 9781416942115, 40pp. still stuck in his teeth. 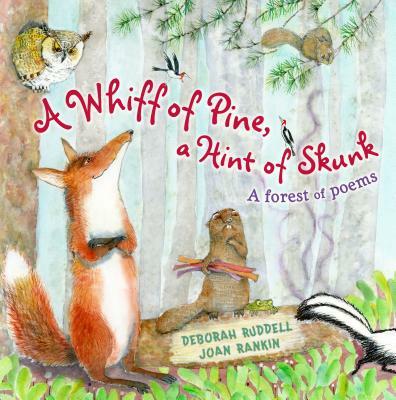 Take a lighthearted romp through four seasons in the forest with these whimsical poems. Marvel at the overachieving beaver, applaud the race-winning snail and its perfect trail of slime, or head off to be pampered at a squirrel spa. Warning: Deborah Ruddell's quirky cast of animal characters and Joan Rankin's deliciously daffy pictures will cause giggles. The woods have never been so much fun! Joan Rankin has illustrated more than twenty-five books for children. She received the South African HAUM Dann Retief Prize for Children’s Book Illustration in 1986 and the Katrina Harris Award for Children’s Book Illustration in 1991. Books she has illustrated include A Frog in the Bog by Karma Wilson and Off to First Grade by Louise Borden. She lives with her husband and three daughters in Johannesburg, South Africa.